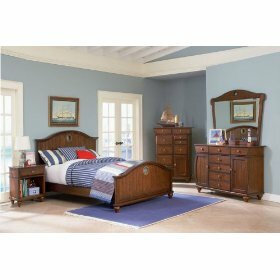 If you’re looking around for furniture and considering a buying a daybed you might be overwhelmed. There are as many choices out there as there are ways to decorate a room. A daybed is nothing more than a really functional couch. You can use it as an extra bed or as a living room accent piece. Some daybeds even pull out to turn into a larger bed. If space is limited in your home a daybed can help make a room more functional; a daybed turns a living room into a bedroom! There are a lot of options for the actual bedding part of the daybed. One is to use decorative throw pillows as a backrest. Of course there are daybeds that have a built in padded back piece too. Even a back piece is optional. There are daybeds that have a small arm chair sort of back rest, othere have a full blown couch look, and there are even ones that look just like a swanky psychologist’s couch with a gentle S curve. 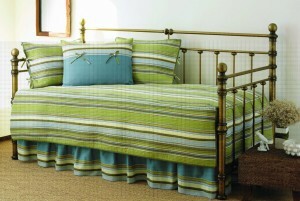 For functional daybeds you can use a twin mattress and then cover it with a tight fitted sheet to match any décor. Style wise they can be made with any sort of framework. From minimalist utilitarian steel tubing to a funky contemporary design, to a rustic rough-hewn wood there is a style frame for any decor. There are plenty of other options available. You can go with a futon, sleeper sofa or a purely decorative upholstered daybed. What it all boils down to is what looks best in your home. Do you need functionality or just an extra couch? Whatever the reason, a day bed can help liven up any home while giving you the functional aspect of having an extra bed on hand. Once you have decided on the style of daybed that suits your home, you will find lots of daybed bedding available with which to dress it up and complete a totally coordinated look. All you need to do is grab a coffee and take the time to browse online for what works just right for you and your decor. 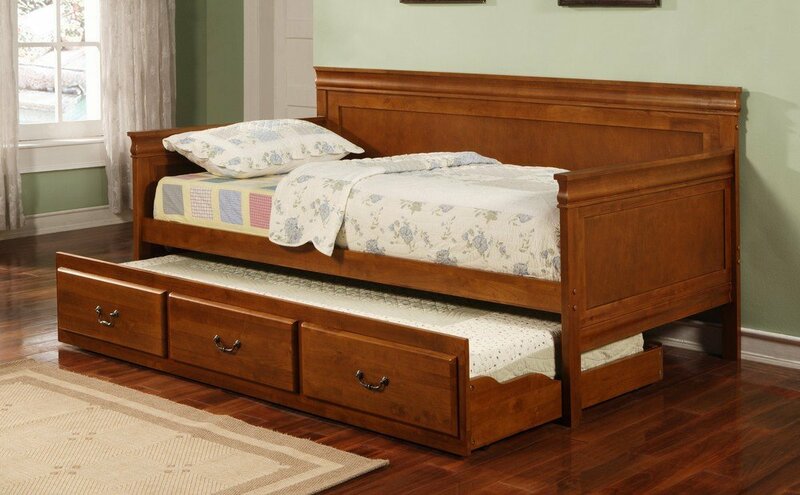 Here is an example of a handy daybed with a trundle for even more bed space. Is it time to change out your mattress? Is your old one lumpy and saggy? Hopefully a few tips on how to choose a mattress will help you get a better night’s sleep. Bedding choices seem endless and overwhelming. They don’t have to be. You just need to keep a few things in mind. Type of Mattresses: The three largest selling types of mattresses available today are coil and spring, waterbed, and memory foam. Coil and Spring mattresses are the most common variety. This is the traditional bed. When looking for a coil and spring mattress one of the key indicators of quality is how many coils the bed has. The larger a number of coils, the firmer, and better quality the mattress. There are plenty of levels of firmness from hard as a board to a light, airy pillow top. What matters is what’s the most comfortable for you! Waterbeds are another affordable option. Once again there are plenty of varieties from wave less to full wave. This determines how much motion the water in the bed will have. If you don’t feel like sloshing around choose a waterbed with a waveless bladder. Waterbeds require a bit more care than a coil and spring or memory foam mattress. They are also much heavier, be sure the floor can support the weight before purchasing one. Once they are in position you are unable to move them without emptying them if you want to rearrange the room. However, I have one and find it very comfortable. Memory Foam mattresses are one of the more expensive options but as the saying goes you get what you pay for. Memory foam mattresses use close cell foam that molds to your body, perfectly fitting your particular body type. Whatever you choose for a mattress just remember it comes down to one simple concept, what is the most comfortable for you? These few tips on how to choose a mattress can help you narrow down your options but only you know what’s the most comfortable! Moving from a crib to a bed is a huge step for your toddler. Every kid is different. Some of them will fear change; others will jump at the chance to grow up. Here are a few easy tips to get them to accept their new sleeping arrangement. Is it time? Before you think of moving to the big leagues make sure your child is ready for the move. Just because he or she is escaping the crib at night doesn’t mean they’re ready for their own bed. Try taking out any guards, and lowering the side of the crib first. By moving slowly your little one gets a sense of freedom in small doses instead of having it thrown at them all at once. Use the same location: Perhaps your child fears leaving the secure crib. 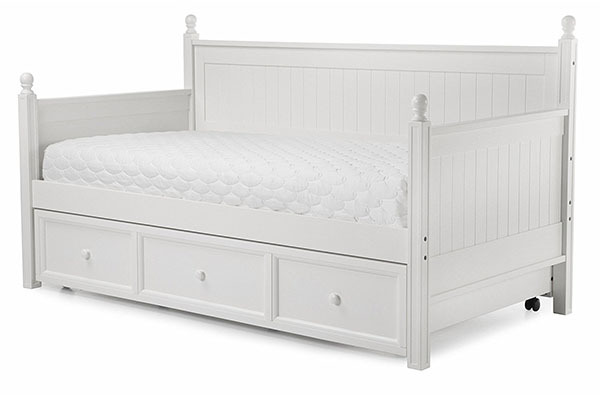 By putting the bed exactly where the crib used to be the child will still have everything familiar and reassuring around. A good option is to try and keep the same bedding, a favorite blanket, or stuffed animal. Plan a party: Make a big deal out of his or her achievement. Call it moving day. Make him or her feel like they’ve accomplished an important goal. It helps to have your child help in picking out the new bed too. Encourage: Every child is different. If your child resists moving into a new bed just keep encouraging them. Positive reinforcement is essential. You can help your child only so far. Punishing the toddler for not moving won’t accomplish anything. Be reassuring and offer positive support. Colorful Bedding: put bedding on the bed that features your toddlers favorite characters. Make the bed look colorful and welcoming for you toddler. There are many ways you can encourage your toddler to make the move from a crib to a bed these few can help get you started on your way with as little fuss and crying as possible. Just remember to be patient!